Pierre Henry passed away last week, on the 5th of July, and it saddens me to see that many current producers of electronic music have barely mentioned his name. His career has been huge, but his influence on our field had been even bigger; without him, many of us wouldn’t be here today. He was first and foremost an experimenter of sound and what makes his work so astonishing is that he was born in an era where electronics were just beginning. For reference, the transistor was invented in 1947, as he was in his twenties. He was collecting sounds on tapes, splicing them, reworking them to no end, creating lush textures of sound where no computer existed, long before the general model of subtractive synthesis became commonplace. He was a maestro of technique as well and sound, using skills and an ear that, frankly, most producers struggle to even scratch in an era where we supposedly have computers that do all this hard work for us in a few mouse clicks. He was a genius, and when I hear young producers saying they are “experimenting on texture”, I can’t help but chuckle. Pierre Henry was lightyears ahead of everybody in this time, and still was at the end of his life, creating incredible symphonies of sounds raw and soft with tools and workflows that he had devised entirely himself, creating results that put everyone else to shame today. He was warping and cutting sounds on tape, dammit. He never let any technical hindrance block him in his path, he did what he wanted, because he was all about the sounds, the landscapes, and he found ways to make things work, no matter what. I was lucky enough to see him in concerts a few times before he passed away and each time it has been a unique, almost transcendent experience. He used to say that he composed with sounds where everybody else composed with notes; the voices and noises of the whole world where his instruments. His is not a music that can be casually listened to while doing other things; it requires attention, presence, the will to embark in a journey that will speak directly to the subconscious as the landscape evolves, evoking images, feelings. 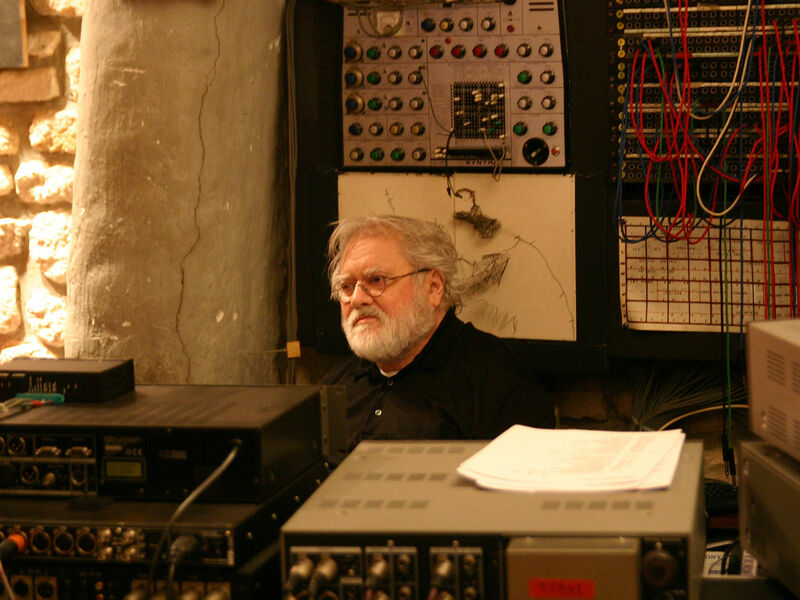 Without Pierre Henry and his groundbreaking exploration of sound manipulation, and his ability to make it known to a wide audience, I dare say there would probably have been no general interest in sound synthesis, no synthesisers nor any progressive electronic rock, no Jean-Michel Jarre and Tangerine Dream, no deadmau5 today. Without knowing it or not, when people utter the sentence “I experiment with sound”, they can do so thanks to his legacy, dedication and hard work. I am saddened by the passing away of this giant, and angry that the big names in electronic music today almost did not mention him or pay tribute to his passing. We, humble producers of electronic and hybrid music, are all in some part the pupils of Pierre Henry, fumbling in the dark where he had always seen miles ahead of all of us. I, for one, would like to remember where we collectively come from, pay my tribute and my respects to that giant of a man, and know that whatever I might learn today, he already knew – but even more, the sole ability of doing what we do, of learning how to do always better – well, in a large part, he is the one who has given it all to us. We are here thanks to him, and we owe him.